Dayo Olaide Less than 48hrs after inauguration, the conference was forced to adjourn so that they could agree on some technical issues. Do you see early resolution of those issues? How much cohesion and negotiations would be seen between intra-groups (e.g within CSOs) and inter-groups considering the initial suspicion which forced an early adjournment? Sunkanmi Adesina What is the essence of having a National Assembly, which I elected to represent me and amend constitutions as at when due? What are we discussing at the conference that cannot be discussed at the National Assembly (NASS)? Why waste N7 billion on a mere national conference which will still pass through the National Assembly (NASS) that is being usurped in the 1st instance? Now that they are talking of 2/3rd ratification of confab decisions, what is the difference between this gathering and the National Assembly? At the inaugural speech, Mr President urged the NASS to include referendum clause in the on-going constitution amendment. Is this not an indirect admission that resolutions of the confab will be subjected to the whims and caprices of the NASS and the President? If you cannot trust the NASS to amend constitutions that will favour Nigerians, how do you come about trusting them to include a provision for referendum in their own ongoing, parallel constitution amendment? The referendum will be debated, pass through first and second readings; pass through endorsement of 24 state houses of assembly; get passed into law by the NASS; then pass to the President for an assent; before it becomes law. This conference will end after 12 weeks. Is it the same NASS that has not passed a single bill into law for Presidential assent in 5 years, except the infamous “gay bill”, that is being looked up to give a nod to the conference resolutions? Finally, what’s the difference, and what will be the difference in the outcome of this present GEJ-confab and OBJ-confab? Is this not doing same things over and over again, and expecting different results? The National Conference is totally unnecessary. Kelechi Deca I support the need to talk to decide how we want to live together if we have to live together. The 75% majority vote is mischievous in intent and it is equally unconstitutional. Emilia Jones We need to know what the national conference delegates think about the N12m paid to them for only 3 months of work. 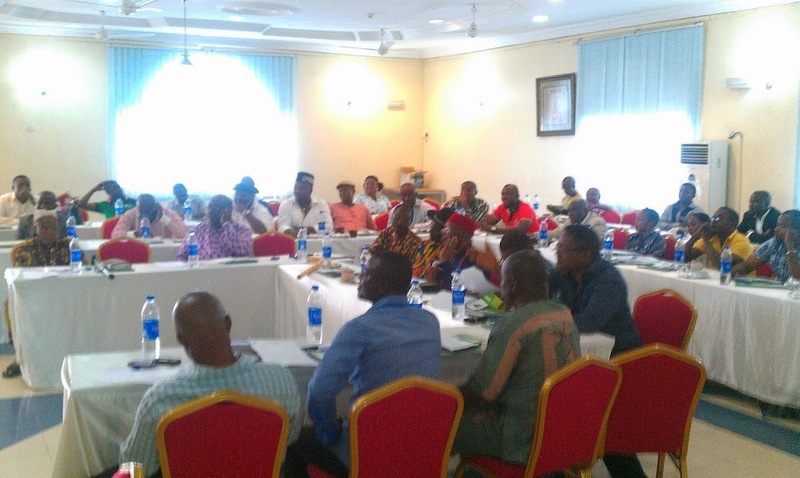 Saya-Braide EbiSo far, confab delegates have not agreed on anything. Just setting rules for the conference alone is giving them a hard start. And this happens in all other important discussions that affect the generality of Nigerians. See why this conference makes sense? We need to talk. Victoria Ibezim-OhaeriIs it possible to have affirmative action for youth representation in all elective positions? If left unchecked, Nigeria’s political leadership will continue to be piloted by the septuagenarians, octogenarians and the Mugabes of Nigeria politics. The youth do not have the clout and resources to challenge these elderly people who have repeatedly failed to deliver. Can Nigeria have at least, affirmative action that allows 25% representation of persons under 40 in all elective positions? Adaeze Ifechukwu Goziem-Ibonye The nation, especially the youths need ethical re-orientation and jobs? What is the plan to revamp agriculture which used to be a major source of revenue in Nigeria and job creation? What needs to be done to sustain the considerable progress that had reportedly been made in the agricultural sector? Wale Edun Four major areas that must be seriously looked into are: (1) Housing (2) Adequate funding for primary health care. (3) Agriculture (4) Empowerment plan for the youth that will create jobs and lead to direct employment. Victoria Ibezim-OhaeriThe dichotomy, nay discrimination, between HND and BSC certificates need to be addressed once and for all. How will this be done? Nigeria needs to set minimum requirements in terms of educational qualification and clearly defined academic background for persons that should be appointed as commissioners and ministers for education. That position should never be used to gratify or reward “anyhow” politicians for their loyalty. Adaeze Ifechukwu Goziem-Ibonye What is the plan to expand the access of all Nigerian children to education from nursery to secondary schools, with well-equipped institutions and teachers. Teachers should be statutorily required to receive in-service training twice each year. Bucky Hassan There is huge agitation for resource control. Why can’t we let the geo-political regions control their own resources, and develop the natural resources that are in their own regions? To run the Federal Government, and ensure there is a ‘fall-back’ loan for regions that might struggle initially, is it not possible to have regions pay 20% of resources generated into a special fund for about 10 years. That fund can then be a funder/lender of last resort, if any of the regions suffer a natural disaster, became temporarily financially strained. Kay Lord Can we please go back to a truly federal system with regional powers like we did in the first republic? Let the present structure of states stand, but become provinces under each region. Let the regions become stronger, generating their own revenues from the natural resources within their geographical entity. Make the center weaker, but strong enough to control defence, internal and foreign affairs etc. Let the regions fund the center with an agreed percentage of what they earn. Possibly, make the present geopolitical zones the new regions. With that done, this would ensure healthy competition among states and encourage rapid development of the provinces. Regions that do not have oil will have to look inwards. Britain has no natural resources, yet it is one of the world’s super powers. Ilemona OnojaCan we institute a phased return to complete resource control for every state over an 8-10year period? Victoria Ibezim-OhaeriThe Igbos are asking for the right of self-determination as summarised in Prof Nwabueze’s memorandum. Some southern minorities have also made similar demands. Will this demand be denied them if these groups are unable to garner the required 75% of majority votes? And would the conference have succeeded if demands of ethnic minorities remain unaddressed? Johnson-Ehidonye Patrick Sopuruchukwu Bernard There is no need for pretenses. The Geographical space and people that make up the present day Nigeria have never really been one. Nigeria is a nation within which abound so many nations, the many contradictions inherent in pseudo nations like Nigeria led to a civil war within 6 years of independence, and has to date sustained ethno-religious strife, and unprecedented inter-ethnic hatred. The multiplier effect of such, hatred, distrust, and suspicion among the different ethnic nations has led to each group seeking to dominate the other, and all forms of marginalization both in strategic federal appointments, citing of federal infrastructure, and resource distribution. Specifically in the case of the Igbo, Federal industries and infrastructure are almost non-existent in Igboland. All strategic federal investments that would improve the economy of the Igbo nation like ie.the dredging of the River Niger and the construction of an inland port at Onitsha, the long promised construction of a second bridge across the Niger which have been commissioned, but why make the Igbos pay 70% of the entire cost. Are we not Nigerians enough? Of the present day 6 geo-political zones, Ndigbo have the least number of states, and correspondingly local governments, which automatically places Ndigbo at the lowest rung of the ladder in terms of allocation of resources from the federal government. The proposed development plan for the Niger Delta being circulated in the Nigerian press, laid down immediate development, and employment initiatives for 20,000 people from the Niger Delta in varied services like the Army, Air force, Police, NNPC etc. Officially the Niger Delta oil producing states are Delta, Rivers, Cross River, Akwa Ibom, Bayelsa, Abia, Imo, Edo and Ondo states. But in the articulated development plan and employment initiatives for the Niger Delta, which was circulated by the Olusegun Obasanjo administration, the 2 core Igbo states of Abia and Imo were subtly excluded, while interestingly Ondo state was included. Against this backdrop it is increasingly difficult for the average Igboman to see himself as a Nigerian. Gbenga Bolejo-ojo We should go for a weaker center, with more powers vested on the constituent units of the federation. Victoria Ibezim-OhaeriSome parties did not send any delegates to the confab. Nigerian Bar Association has also pulled out of the confab. Did the confab leadership make any effort to assuage these aggrieved groups? How impactful will this conference be, without the input of such critical stakeholders? Funke Tega Phillips What measures can be put in place to ensure private businesses adhere to the minimum wage? Gbenga Bolejo-ojo A fund should be set up to take care of unemployed people. States must ensure that every retiring civil servant must have an accommodation within his or her cadre to settle to, once he or she retires from public service. This will help to stem to a reasonable extent, the greed to acquire wealth illegally. Saya-Braide EbiThe issue of minimum wage should be decided by states, not by FG, especially when resource control seems to be the front burner issue. Kelechi Deca We must not lose sight of the fact that Nigeria as presently constituted is nowhere near becoming a nation. Interestingly, most Nigerians are in agreement that at this critical stage there is need for Nigerians to sit down and discuss. We need to do away with what we have now as Constitution. The 1999 document is not it. In a pre -Conference event which I participated in Enugu orgnised by an amalgam of Igbo intelligentia, we agreed on the need for the repealing of the 1999 Constitution as the way forward to ushering in a peoples’ constitution. Our arrow head in that gathering, legal icon, Professor Ben Nwabueze argued that contrary to the opinions of some, that the 1999 Constitution is not an impediment to the newly expected Constitution. Nwabueze maintained that the 1960 Independence Constitution was established by section 2 of the Order in Council; for the 1963 Republican Constitution to come into effect, section 2 of Order in Council was repealed. To this end, all that is needed is for the 1999 Constitution to pave for a new code book is for Decree 24 of 1999, which established the 1999 constitution to be repealed. Sunkanmi Adesina According to Section 1 of Nigeria Constitution, the Constitution is superior to all other laws of the land including Decree 24 that established it. This means that only thing that could change anything in Nigeria is constitution amendment, and not a conference! Ilemona OnojaI do not see anything wrong with continuous amendment of the 1999 CFRN. The American Constitution has been amended 27 times. That is how to attain constitutional growth. This process of throwing constitutions away is a reason why Nigeria hasn’t progressed rapidly. There is no constitution that will be perfect as it cannot envisage all scenarios and there will always be loopholes. This is where a strong judiciary is imperative. Constitutional amendment should be attained by interpretation and judicial activism. I do not agree that the 1999 is worthless. It is actually a very good document. The lack of political willpower to adequately implement its provisions as well as judicial speed to inteprete it in times of crises are some of the reasons why we have many problems today. Kalu Aja We need to create a national social security safety net for all Nigerians? There are many ways to fund this: tax on private jets, transfer of petroleum subsidy to social security fund, tax on imported consumption. 2. Can we adopt the Brazillian example and dedicate 100% of oil and gas royalties to education? To fund voucher program to enable any Nigerian attend any school and use the royalties to pay school fees? 3. Land Use Act: Can we scrap the land use policy or remove it from the constitution so states can amend their land laws to suit their needs. Funke Tega Phillips Can we have State Police? Let the police be responsible for enforcing laws in their own states? Emilia Jones The judiciary and the police need to be totally revamped. All teachers and lectures need to take standardized tests before recruitment for quality control. Emilia Jones The presidency should rotate amongst all the main tribes, every 4 years. The presidency should rotate in this manner; Igbo, Yoruba, Hausa, Itsekiri, Ibibio, Efik, Urobo, Bayelsa, Ogoni, Opobo, Idomas and so forth. Bucky Hassan The presidency should rotate among all the 6 political regions, instead of tribes. Rotate it every 4 years and then no region would complain about being marginalised. Each region can sort out among themselves, what tribe they want to represent them. Emilia Jones: It is time for Nigeria to strengthen local government autonomy such that the local governments will be truly independent and separate from other tiers of government, and independent of the states? Ilemona OnojaThere is need for the Independent National Electoral Commission (INEC) to be restructured. Can we completely restructure INEC/our electoral laws to achieve better results? First, the INEC chairman and the INEC commissioners should NOT be appointed by the president. It does not guarantee impartiality. Secondly, digitalize all their operations on electoral activity. In this day and age when smart phones can do almost anything, it remains a mystery that we cannot vote digitally. Third, ensure the prosecution of all electoral offenders. All thugs and touts involved in electoral fraud should be arrested and prosecuted to deter future offenders. Nsikan-George Emana Going digital is a viable option as it may address the entrenched thuggery component of our electoral practice. But this is capable of disenfranchising many who do not have access to internet access and digital devices. Also, the prosecution of electoral defaulters is hardly achievable with the corrupt trend in the judicial community. Adaeze Ifechukwu Goziem-Ibonye When will Nigeria boast of constant power? What is the plan towards achieving this because betterment of education, health care are not realizable without power supply. Even the digitization of electoral data and activity is not possible without adequate supply of power. We should look towards revamping existing Science and Technology Colleges to stop a concentration on white collared jobs. Vocational Schools to be set up to teach skills that are required in another sector.